Here is the complete tutorial on the origami wreath that Lynn Butler demonstrated at a Reedsburg Area Quilt Guild meeting. I would like to first thank Lynn Butler for all of her hard work and expertise on this project. You are truely a generous and wonderful lady! Lynn Butler's first wreath she brought in. These could be used as a doily, table runner or hung on the wall. Lynn made this one as a table runner in greens and tacked three of them together. As you can see, if you vary the colors in your triangles you will get a different effect. The name on the pattern is called Origami Christmas Wreath and was an original design by Lynne Edwards. 3. General sewing kit of needle, thread and scissors. Cut the two different colored fabrics into 5" strips. You will need to cut two strips for each color. Lynn said she gets 13 per strip on a 44" wide strip. Next take the 5" strips and cut them into 60 degree triangles (18 equilateral triangles from each of the two colors). 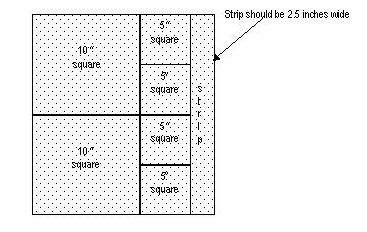 See the tutorial about how to do this here at the EZ Quilting Ruler site if you don't know how to cut a 60 degree triangle with the EZ quilting triangle template or some of their other rulers. Thank you EZ Quilting for your tutorials on how to use your wonderful rulers. You can also check here at About.com where Janet Wickell has posted a wonderful tutorial on how to cut eqilateral triangles and many other shapes with a rectangular ruler. Thank you About.com and Janet Wickell for your generosity in teaching us this skill. The next step is optional but will save you handsewing later. I had planned on maybe trying to glue the opening shut at the end, but I remembered a technique that I saw on Sewing with Nancy. Before you put the pieces together first put fusible tape on one edge of the RIGHT side of one triangle. This is Clover brand fusible web that is 5 mm. wide. It is used to put bias on stained glass type quilts or celtic bias. I cut it 2 inches long. It is ironed onto the RIGHT side on the middle of one edge, and then the paper peeled off. If you have something like Heat N Bond you could cut this into 3/8" pieces x 2 inches long to do the same thing. You could put a sheet through a paper shredder to get many pieces cut fast. Only one of the two triangles put together needs the fusible for this technique. Next peel the tape off. You can see on the burgundy triangle the fusible glue. There is no fusible on the tan triangle. Next put one of each of the two different colored cut 60 degree triangles right sides together. I put pins at the beginning and end of where the fusible was so that I didn't sew there. Sew around the sides of the triangle using a 1/4" seam allowance and leaving about 2" open (where you put the fusible on if you chose that technique) on one side so that you may turn it right side out. Do this until you have 18 sewn triangles. Crop all 3 of the corners, but don't cut your seam. Turn them all right side out and try and get all of the corners pushed out to make them as sharp as possible. Press. If you haven't put the fusible web on you should tack the seam allowances closed. This is where all I had to do after turning things right side out and making sure the corners were pushed out as far as they go was to press the opening closed. I love this technique. It save me a lot of time handsewing the openings closed. Next fold all three sides and crease to mark your center. You can see where the creases meet and mark the center in this triangle above. Tack all three corners to the center of the triangle. Next you will turn the hexagon shape over and tack the side to the middle. Do this on all three sides. The picture on top has the finger pointing to the place that should be folded back. The picture on the bottom has a needle pointing to the place that is tacked. Here you will see two sides tacked. Continue until all three are tacked. Here are two triangles completely tacked and then tacked together in two spots. I hope you can see those two points. My finger is pointing at one point, and a scissor is pointing at the other. Here are three tacked together for a total of 6 tacks for a subunit. This picture shows you how the two different sides look at this stage. Here all of the subunits are assembled and waiting to be assembled as a whole. Take two subunits and tack them in the 4 places that touch in the picture above. Keep tacking your subunits together like above. Completed wreath on other side. I hope this answers all of your questions about this project. If not, please feel free to e-mail me, and I will be happy to help you in any way I can. This tutorial will be permanently available in our tutorial section in the sidebar. I just found a printable PDF version of this pattern by Lynn Edwards for Checkers/Creative Grids Rulers here. for some reason blogger won't let me sign in!!! thank you so much for publishing this tutorial... appreciated!